My friend Homer H. Hillis of HHH Enterprises has a never ending array of fabulous new toys for the mixed media crafter. He sent me some new Our Glass pieces recently that are totally awesome. They’re thick, they’re smooth and they are optically clear. That means whatever you put behind them is slightly magnified. He also sent a roll of 3/4” thick foil tape to help seal the images. 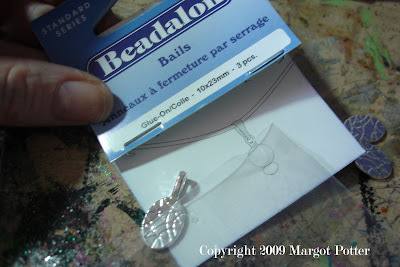 Beadalon just came out with glue friendly pendant bails and BeadFix glue in sheets! 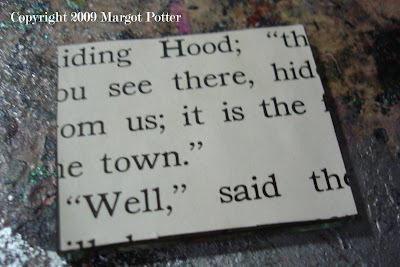 I kept this simple and straightforward, so I can use them as striking focal elements in some new designs. 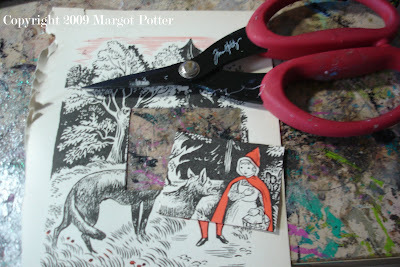 The images are from a recycled vintage children’s book I purchased this past weekend. You can opt for permission free images or other images that suit your style. I love recycling fashion magazines. Don’t scan and manipulate images on the computer unless they’re permission free though, using the actual page is recycling, copying the page is copyright infringement. 1. Place Our Glass wafer over selected image and trace with a marker. 3. Spread a thin, even film of adhesive on wafer and adhere to glass. 4. Use fingers to gently work out any bubbles under glass. Allow adhesive to cure. 5. Place tape over back of decoupaged glass, if rectangle or square shape, leave an overlapped edge that is flush with top edge of glass. 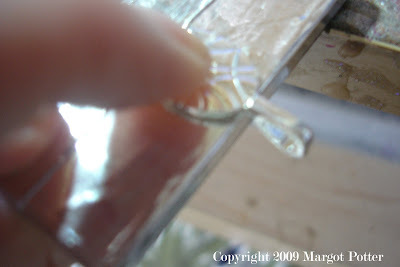 (If round glass, leave a small 1/6” edge. 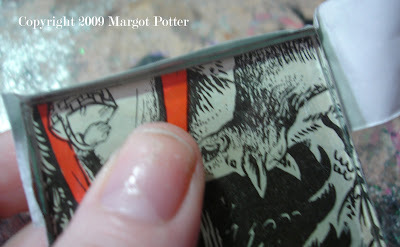 Designer note: You may need to add a second layer of adhesive to get the tape to adhere and stay there.) Mark and cut with scissors. 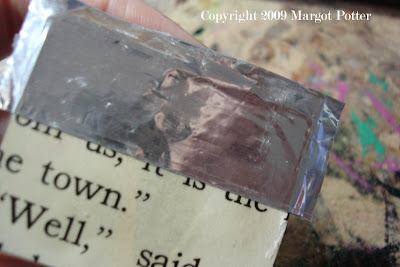 Use bone folder to burnish tape edges flush to glass. 6. Adhere tape. Repeat adhering tape strips moving from top to bottom of back of pendant until finished. 7. 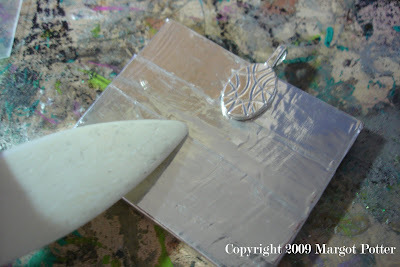 Place flat side of bail on back of glue square and use as a guide while you cut out glue to fit bail. 8. Adhere bail to center top at the back of the pendant. 9. Use your bone folder to smooth out any wrinkles in the tape. 10. If you'd like, you can add a layer of solder to seal everything inside or you can opt to leave it as is. If you're hard on your jewelry or plan to wear this often, I suggest the solder! Until next time...craft on with your bad selves! fabulous. 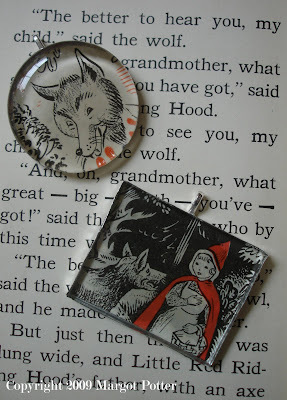 so many images I love can be worn this way. GREAT. These are fabulous! I am going to have to pick up some of those sheets! Thanks tons for the wonderful project, I'll be linking. Great idea! 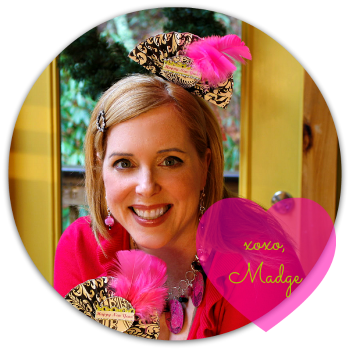 I've been in love with your designs since I saw your feature in the Get Creative magazine!